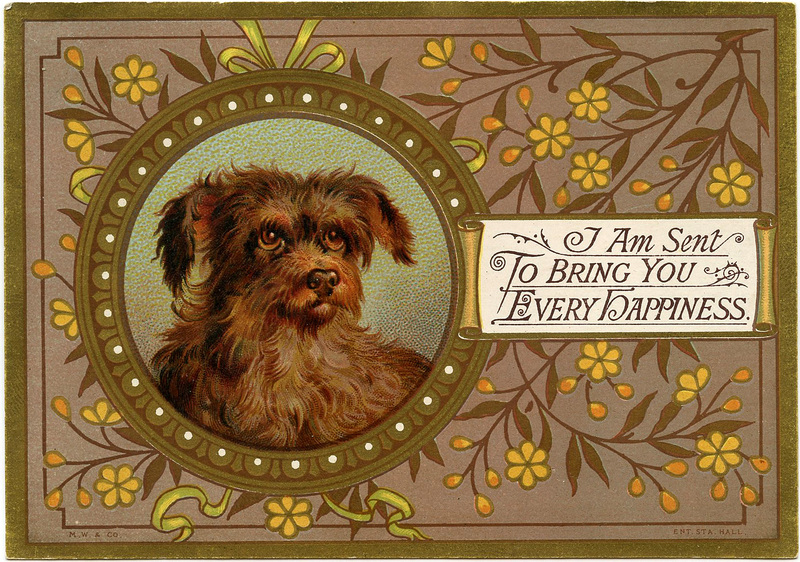 Today I am sharing a large collection of 21 Vintage Dog Images – free for your use. 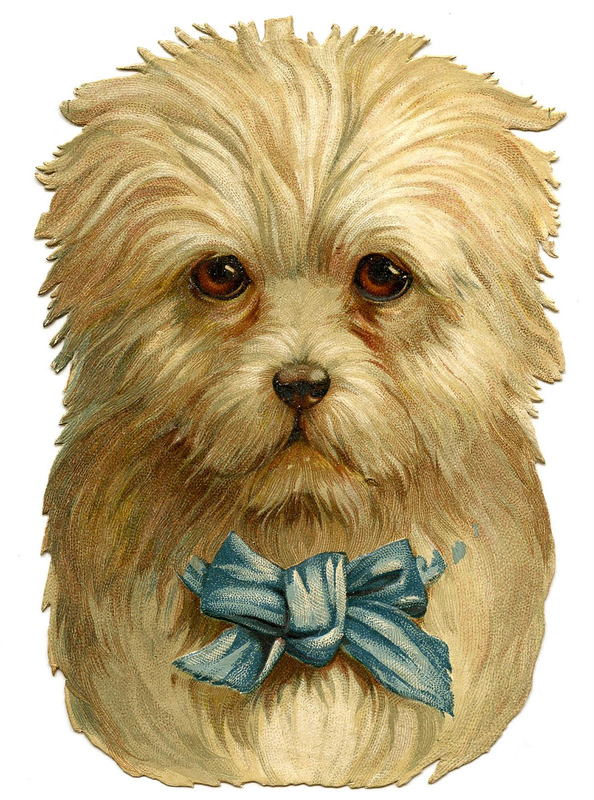 Below are some of the most adorable dog illustrations you can imagine. We have vintage advertising pieces featuring fun dog graphics. 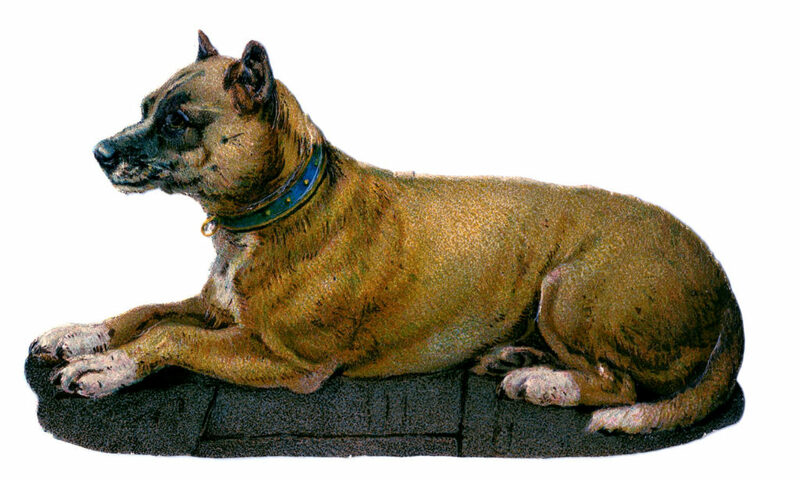 Also included are Victorian Dog Scrap Images and old postcards with cute dogs. 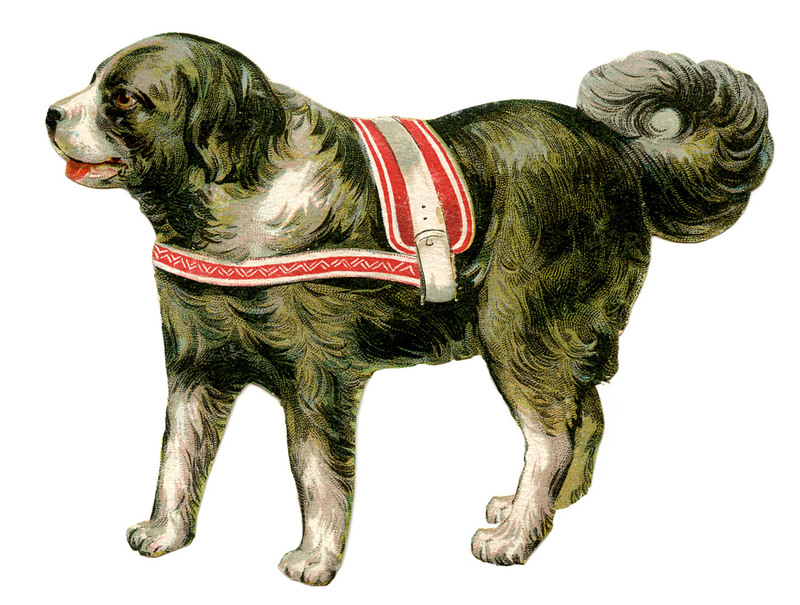 Our vintage dog pictures would be awesome to use in your Mixed Media or Craft Projects! Here we have a sweet little Dog with Sign Scrap piece! It looks like a cute little Terrier to me and she’s holding a Pink Sign with some lovely ornate text on it. I’m also including a version without the wording so that you can write your own. It would make a cute Tag or Label. 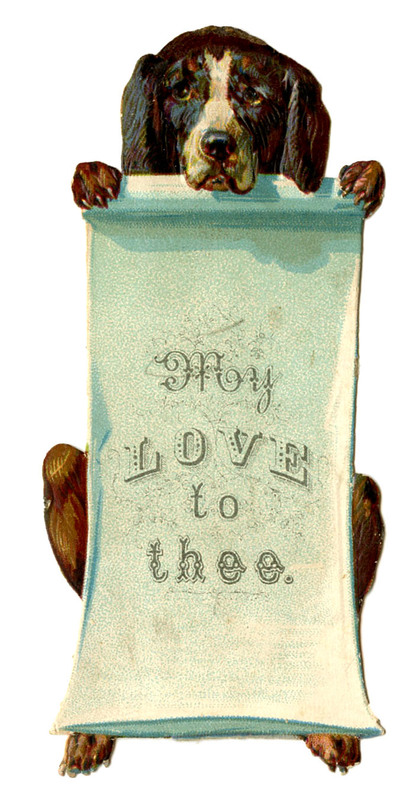 Above is another cute Victorian Scrap piece showing a Dog holding a Sign! The sign has the sentiment “My Love to Thee” on it. Very sweet! I’m also including a version without the wording. 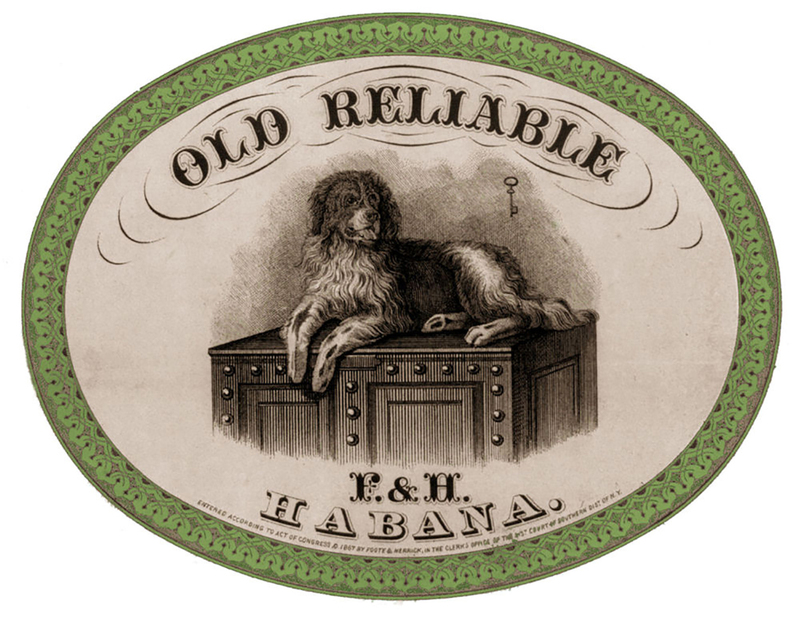 Above is an old cigar label that has a sweet dog on it. He appears content sitting on top of a chest. Could he be protecting the cigars? This is fantastic Vintage Dogs Trade Card! 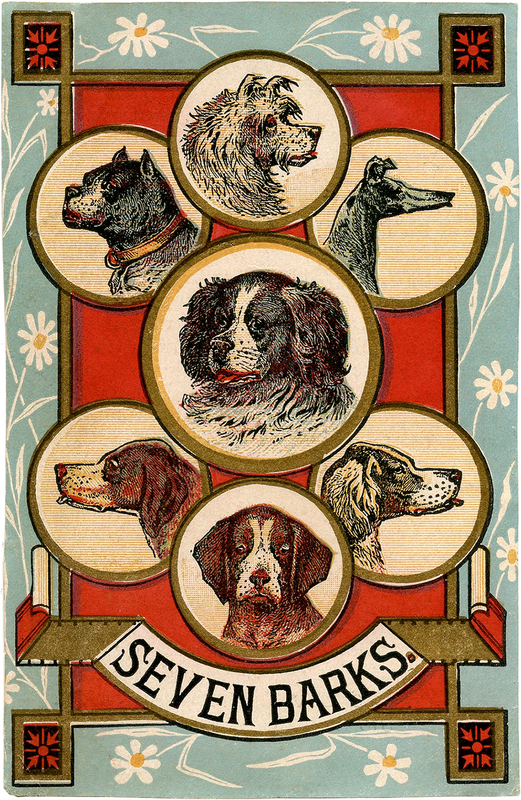 Shown above is an old Advertising Card featuring seven adorable Dogs! The card was made to advertise Seven Barks… although I have no idea what that was! I love the red and blue color combo on this one and the layout of the card is awesome! And such a fun one to use in your Furry Friend themed projects!! 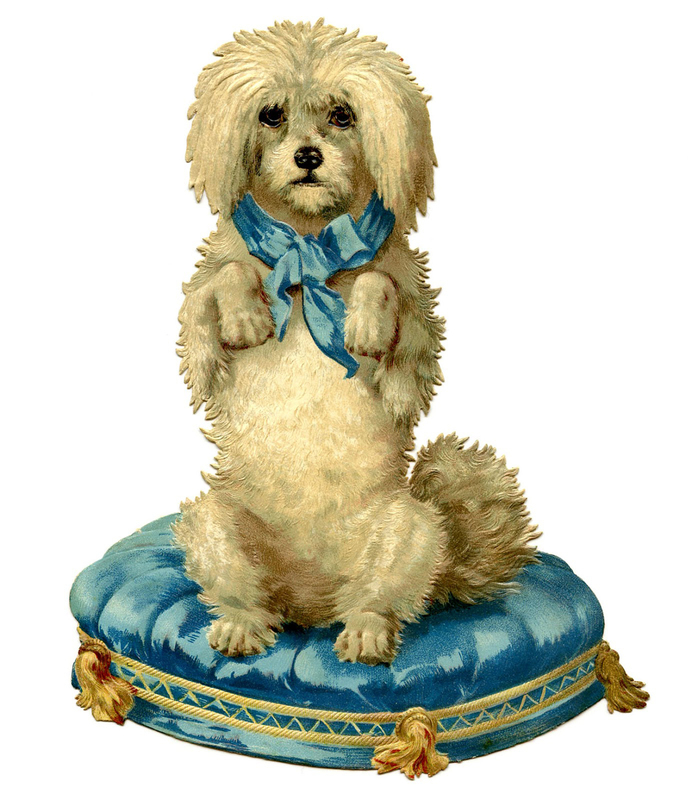 This image is a gorgeous Victorian Scrap of a darling Dog on a Blue Satin Tufted Cushion. Adorable! 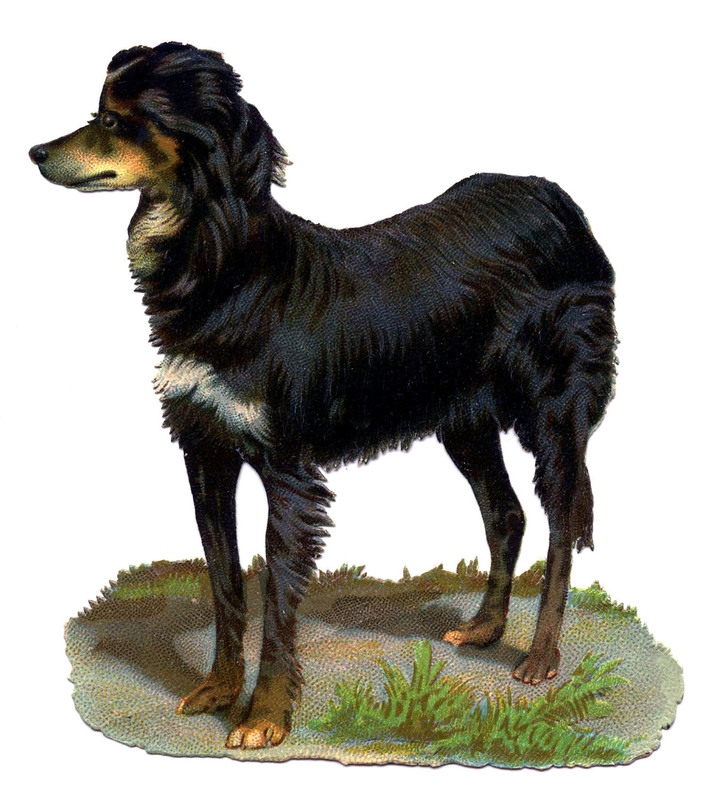 Here’s a sweet Vintage Graphic of a Black and Brown Dog. I’m not sure what kind of Dog this is, but he looks very nice! 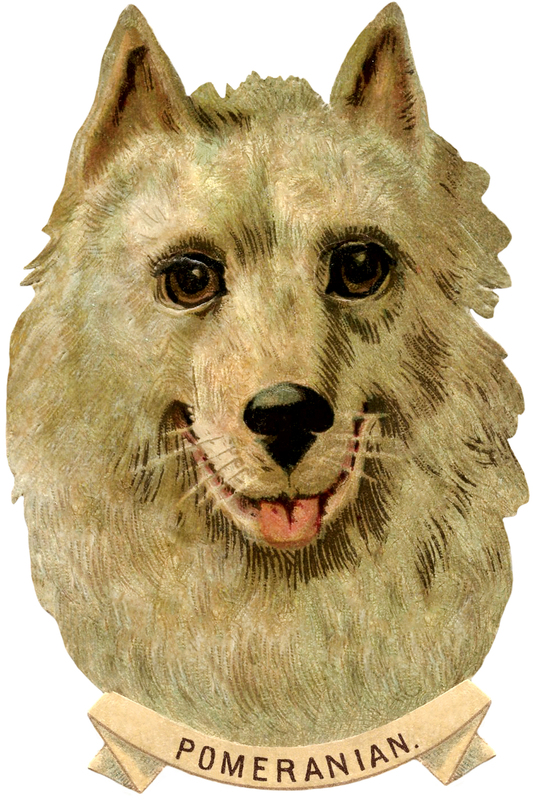 This is a cute Pomeranian Dog Image! It is Antique Victorian Scrap Die Cut piece. It’s the bust of a Pomeranian, (or at least it’s supposed to be), according to the little paper tag attached to him. Here’s a dear little Antique Scrap Piece! 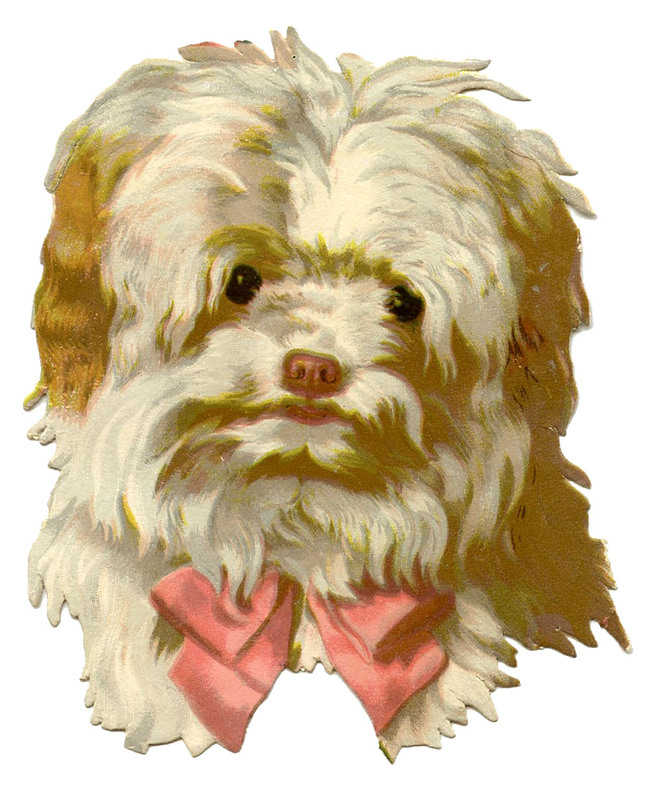 Pictured above is a Vintage image of a scruffy looking little Dog with a Pink Bow. She has sweet eyes (I’m assuming she’s a she, with the pink bow and all), but looks a bit sad to me. I’m not sure what breed this is supposed to be … maybe a Terrier of some sort? I know some of you guys will be able to figure it out! 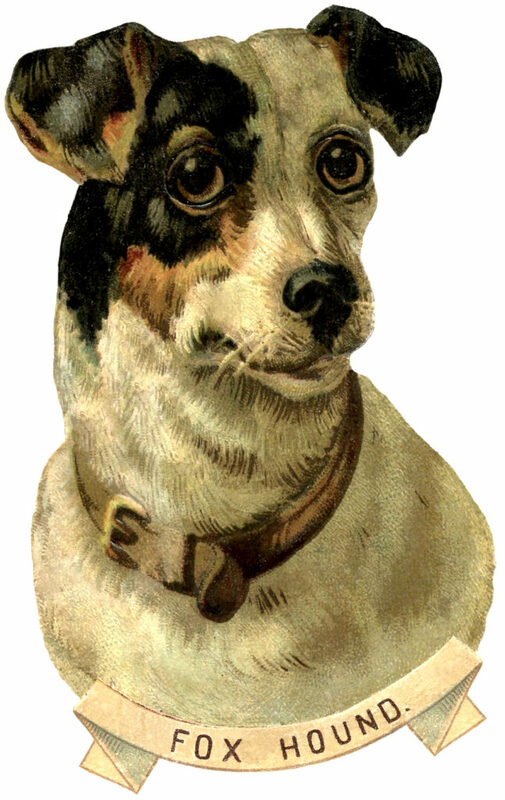 This is a cute Vintage Image of a Dog! I think he is some kind of a Spaniel; hopefully one of you guys can verify that. Update: I am told that this guy is a Cavalier King Charles Spaniel. Thanks for all who helped out with info on this one! He’s a cutie with precious eyes and his blue satin bow! Isn’t he adorable?!!! This is an antique Victorian Die Cut or Scrap piece. What a precious little Dog he is! I’m not entirely sure what kind of breed he is… a Maltese? or some sort of Terrier? Either way he’s cute as a button! 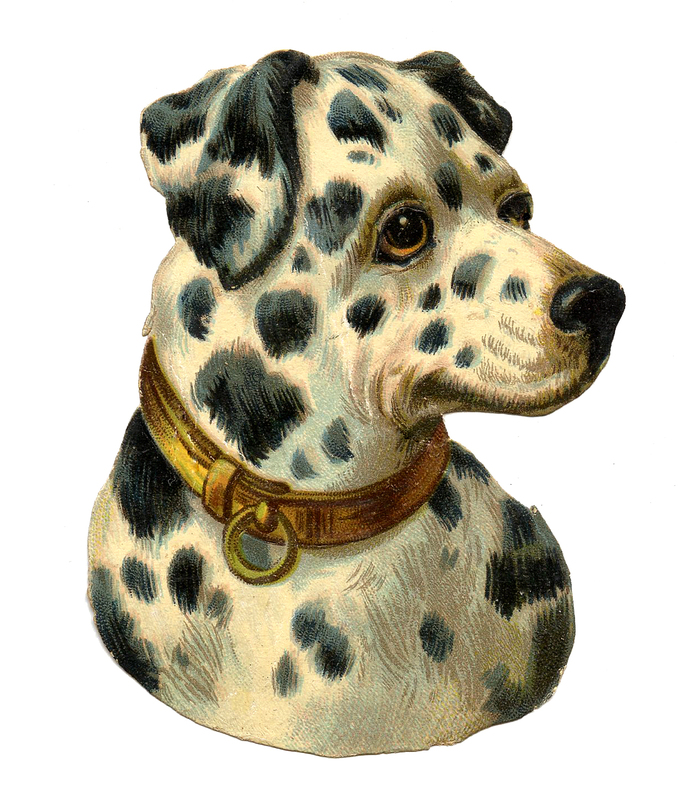 Here we have a darling Free Image of a Dalmatian Dog! He has all his lovely spots and a nice gold collar. He almost appears to be posing. Above is an old Victorian Scrap piece. This shows is a darling little Pug dog! I think he looks so cute with his blue collar full of bells! 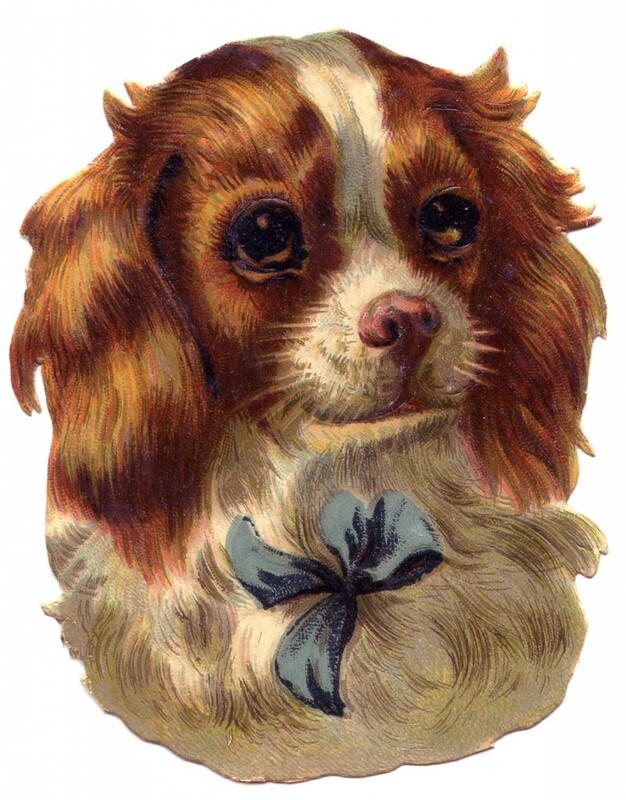 This is another cute Scrap Dog Free Vintage Dog Image! It is an Antique Victorian Scrap Die Cut piece. It’s the bust of a cute cream colored Dog with Black and Brown spots. According to his little tag, this is a Fox Hound although he looks a lot like a Jack Russell to me. Perhaps the breeds are related? I’m sure some of you probably know the answer to that! This is a sweet looking Dog! I love his shaggy tail. I think it looks like a Saint Bernard perhaps? Cute! This is a piece of antique Victorian scrap. These pieces were often made in Germany, but it’s not marked so I can’t say for sure. What a strong proud looking Dog this guy is. I wish I could tell you what breed he is, but I guess I don’t know my breeds that well! Perhaps it is a Boxer. Please clue me in should you know the answer. 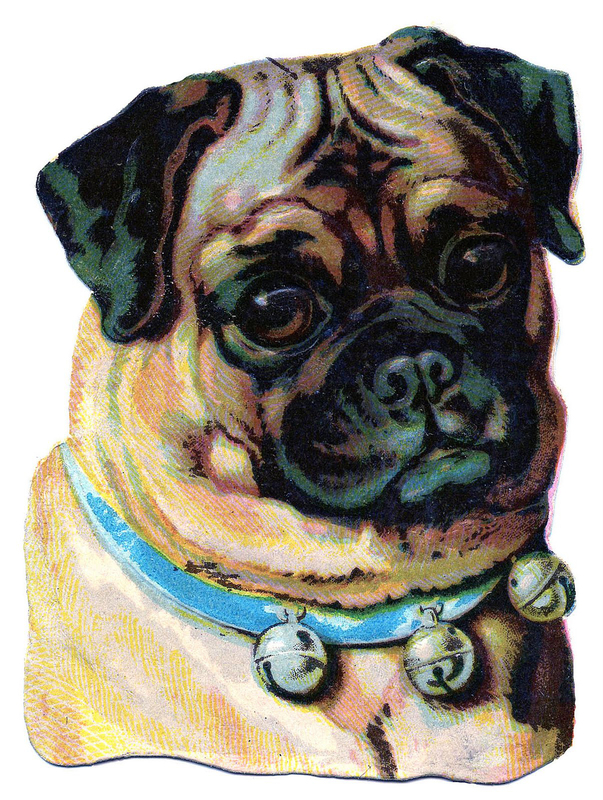 Above is a Vintage Quirky Dog Image! Pictured here is a funny little Dog with a bow and large bell around its neck. I love that sweet face! Cute! This one is a splendid Antique Scrap Die Cut piece. Here we have a cute Vintage image! 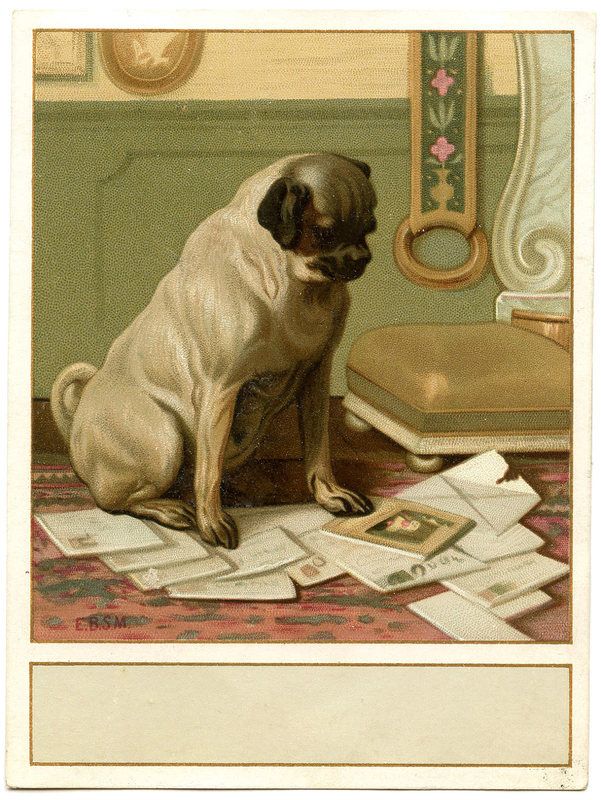 This one shows a darling Dog (a Pug I think) helping to sort the Mail! Haha! The image has a little space at the bottom, and could be used as a Label. Perhaps you could use it to label and sort your own Mail or other Important Papers. 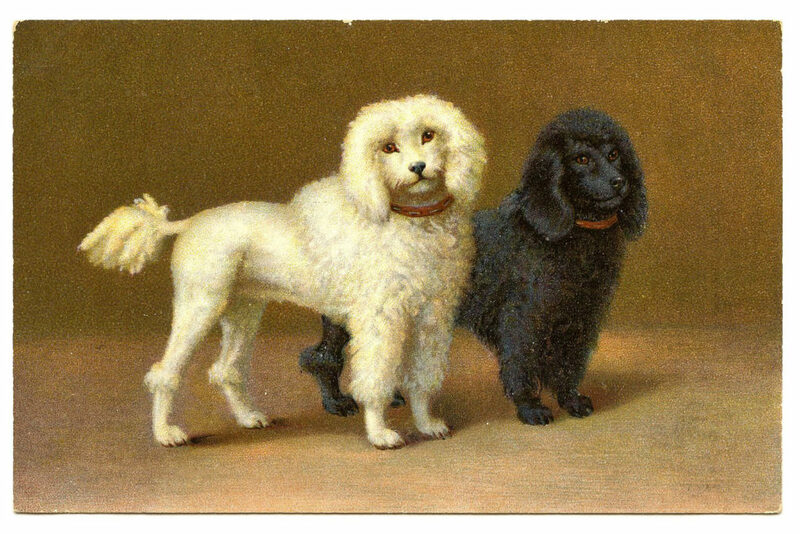 Our final image in this set is a nice old postcard showing two adorable Poodles!! Don’t they have sweet faces? How precious. I hope you enjoyed this curated collection of Vintage Dog Images. You might also like 40 Best Free Bird Images HERE! 10 Vintage Christmas Dog Images! 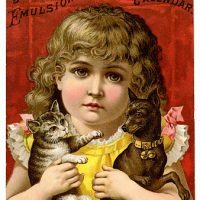 13 Vintage Clip Art Children with Pets – Darling! Retro Puppies in Ornate Frame Graphic! Thank you Karen – he is cute!! He is adorable! Thank you! The spaniel is a Cavalier King Charles spaniel, a darling breed. That cute little Spaniel is a Cavalier King Charles. Soooo cute just like my little Cooper. Thank you Vickie! Looks like we have some fans of that breed here!